The original ISKCON Panca-Tattva Painting. Lord Krishna enjoys by manifesting Himself as the Spiritual Masters, the devotees, the diverse energies, the incarnations and the plenary portions in the form of the Panca-Tattva. The Panca-Tattva are all six in one. I therefore worship the lotus feet of these six diversities of the one truth, the Panca-Tattva, by invoking their benedictions. I offer my respectful obeisances unto the spiritual masters, the devotees of the Lord, the Lord’s incarnations, His plenary portions, His energies and the primeval Lord Himself, Sri Krsna Caitanya Mahaprabhu. Lord Nityananda is even more merciful than Sri Caitanya Mahaprabhu because after Nitai was struck on the head with an earthen pot by the sinful Jagai and Madhai, He stopped Lord Caitanya from killing the two criminals. He begged the Lord to spare their lives because after all, their mood was to make devotees by killing the demoniac tendencies within, not by slaying wrong-doers. The Lord agreed to do this if the demoniac brothers would give up their sinful activities and change their bad habits into Krishna Conscious ones. By His request Mahaprabhu spared the brothers. By this mercy, the brothers fell at the feet of Caitanya Mahaprabhu and immediately surrendered their lives in devotion to Lord Caitanya. Advaita Acarya is in the Visnu tattva with Sri Caitanya Mahaprabhu, and Sri Nityananda prabhu. 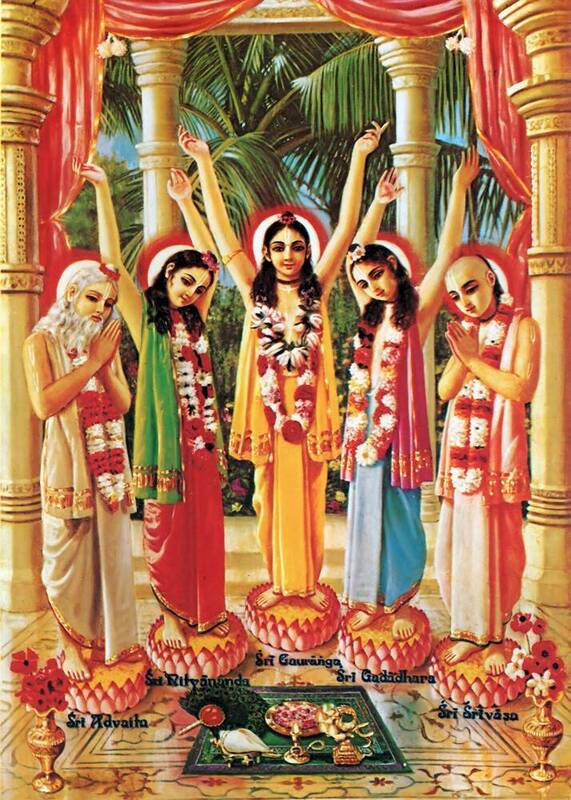 These are the three masters, but Nityananda and Advaita are servants of Mahaprabhu. It was Advaita Gosai who prayed to the Lord by offering water and Tulasi leaves to His Salagram Sila Krishna Deity by loudly roaring his request for the Lord to appear. Gadadhara is the incarnation of devotional energy and of the internal potency who is sakti tattva, the confidential worshipper of the Visnu tattva. In this incarnation, Radharani was able to spend time with Her Lord as an intimate associate who helped spread the pastimes and glories of Sri Caitanya Mahaprabhu. Even cats and dogs in the household of Srivasa Thakura were also liberated. Cats and dogs and other animals are not expected to become devotees, but, in the association of a pure devotee, they are also delivered.